Courtney Force and Clay Millican upset the odds to claim the No. 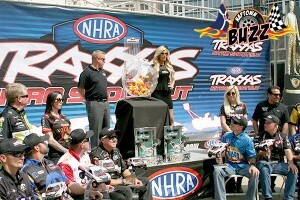 8 positions in the Traxxas Nitro Shootout following special lottery drawings held today during a press conference in downtown Indianapolis to preview the Chevrolet Performance U.S. Nationals, the world’s most prestigious drag race. Photos from the 2015 NHRA Traxxas Nitro Shootout Lottery on Monument Circle in downtown Indianapolis on Wednesday, September 2, 2015.